If it weren’t for Instagram I might be living alone in a rented storage locker on the outskirts of town among piles of vintage action figures procured from eBay. Allow me to clarify. 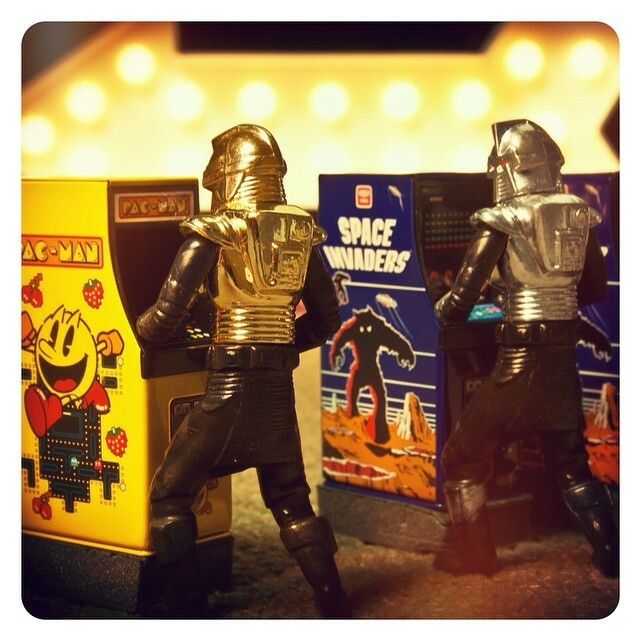 I spend a significant amount of time looking at photos of vintage action figures on the internet. Many of these action figure photos are found on eBay, positioned dangerously close to Buy It Now or Place Bid buttons. For someone with a lack of willpower and flimsy self-control, it is too easy to cross the line that separates “I’m just looking,” from “I NEED TO OWN THIS NOW” leading to the dismal scenario mentioned at the start of this article. Eventually, I found my way to Instagram. I’d initially resisted the social media platform assuming it to be a repository for duck-faced selfies and photographs of meals recently consumed. That it is, but I soon discovered that it also serves as a showcase for artists and collectors alike. With a few hashtag searches, I curated my feed to include a network of folks who shared my appreciation for art, collectibles, and pop culture. 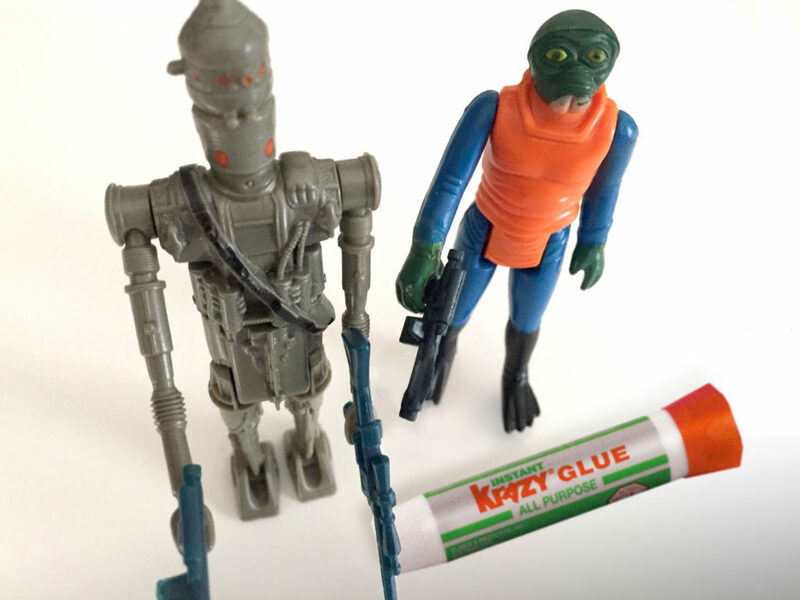 Most everybody is equipped with a digital camera these days, and those, like myself, who regard toys as significant cultural artifacts, feel compelled to share their toy photos online. The photos range from snapshots of shelved collections to the artfully composed. An old favorite of mine is Chris McVeigh’s A Breakfast of Champions, in which Stormtrooper helmets float in a bowl of milk—a surreal Imperial breakfast cereal. Similarly, Edy Hardjo’s superhero action figure photographs have been hard to miss lately. 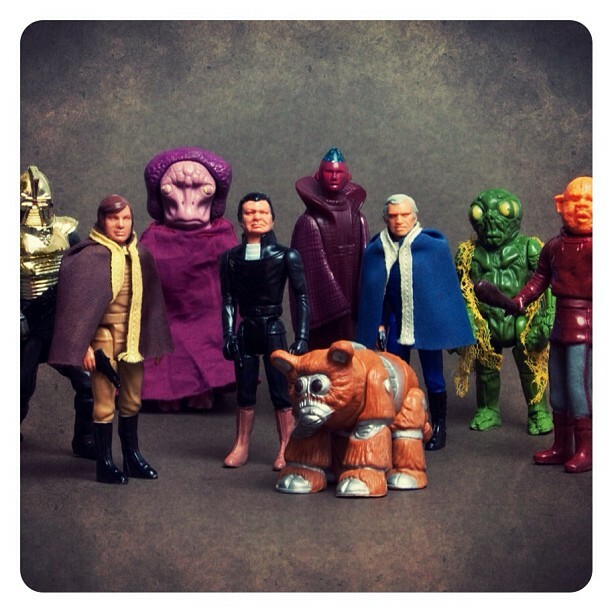 Somewhere in my Instagram toy gawking, I happened upon the feed Danny Neumann, aka Cantina Danny. I was initially drawn in by a series of shots featuring complete sets of 1970s and 1980s action figures like The Black Hole, Battlestar Galactica, MAS*H action figures and even the rare Magnum P.I. 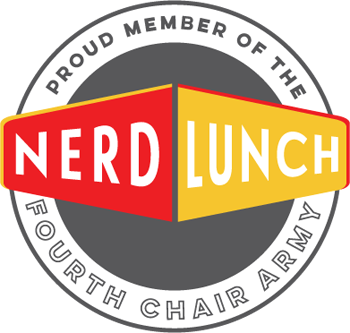 figure from LJN. The photos, set against a mini gray studio backdrop and thoughtfully posed with great attention to spacing, gave the figures the air of significance worthy of historical luminaries on the precipice of an iconic moment in time. I imagine that even viewers unfamiliar with the figures would get the sense that they were somehow important. I marveled at his collection of photos of figures shot over solid complementing color blocks and arranged in tidy grids reminiscent of Warhol. 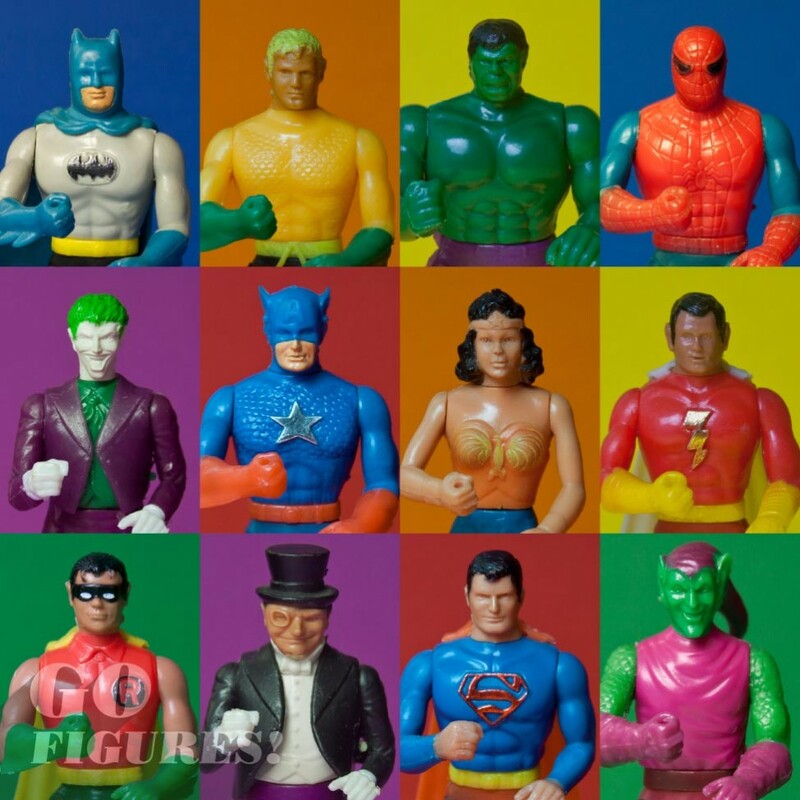 Here instead of Marilyn Monroe, were Sesame Street Little People, Mego’s Comic Action Heroes, G.I. Joe, and Masters of The Universe figures. In his Instagram feed, I found the visual nostalgia for my own childhood experience. A frequent motif in Neumann’s photographs is the dichotomy of sameness and difference. 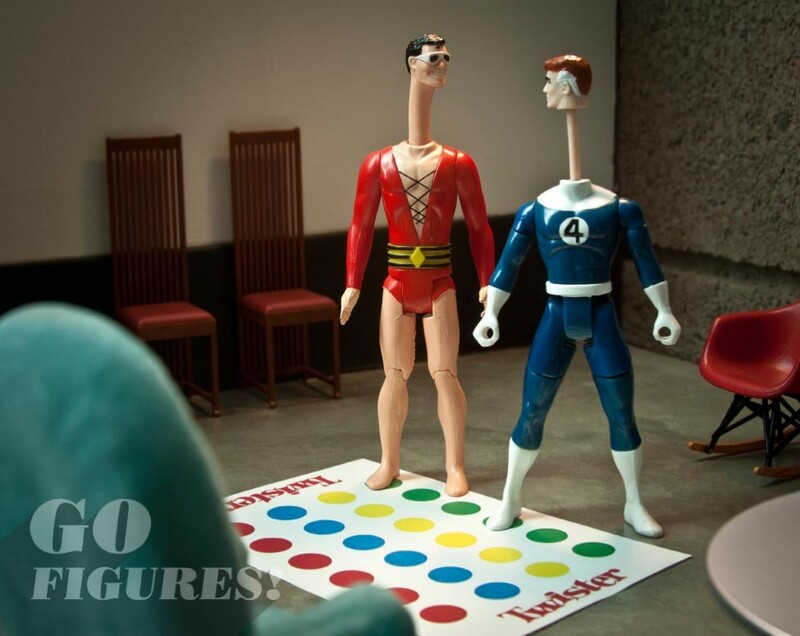 This is evidenced in a photo of Reed Richards and Plastic Man, with their equally elongated necks, eyeballing each other as they stand over a Twister mat (in an alternate shot, the a yoga mat replaces the twister mat). 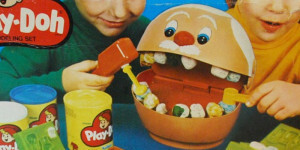 Both figures, by Toy Biz and Kenner, respectively, were properties that competed for parent’s dollars in the mid-1980s. Here, Neumann pits these similarly stretchy, but ultimately different, characters in a friendly game of Twister. It has the innocent wonder of a child who would rather play with their toys than consider the Marvel vs DC vs Toy Biz vs Kenner licenses. Similarly, Neumann explores the sameness and differences within single characters in a series of photos that documents the character’s evolution. 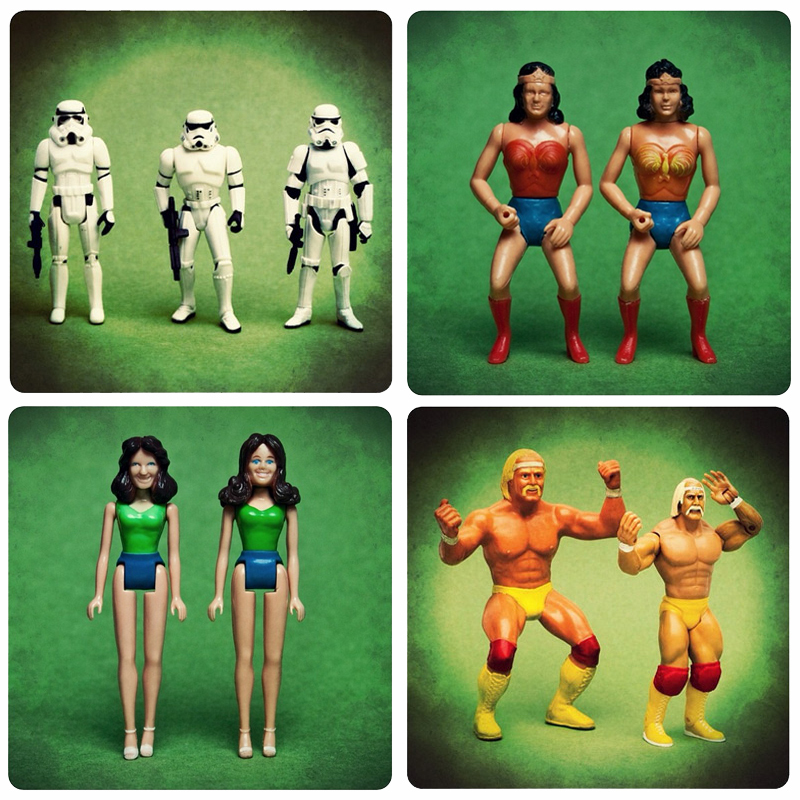 With an anthropological eye, he traces these evolutions through production variants and compares the vintage vs modern representations of action figures. 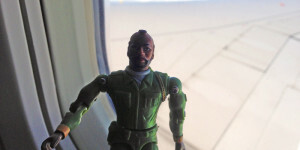 Neumann also playfully chronicles action figures and their respective modes of transport, ranging from the A Team’s B.A. Baracus outside of his iconic signature GMC van or Mork beside his interstellar eggship. This same playfulness is present in the shots of good guy action figures vs bad guy action figures in which benevolent heroes stand shoulder to shoulder with their nemeses, arch or otherwise. Neumann’s work shines the most in his on location shots. 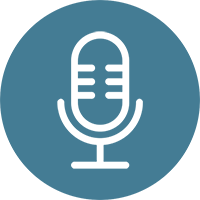 By setting these figures in natural environments, employing artful forced perspective, and immaculate compositions, Neumann is able to breathe life into plastic. 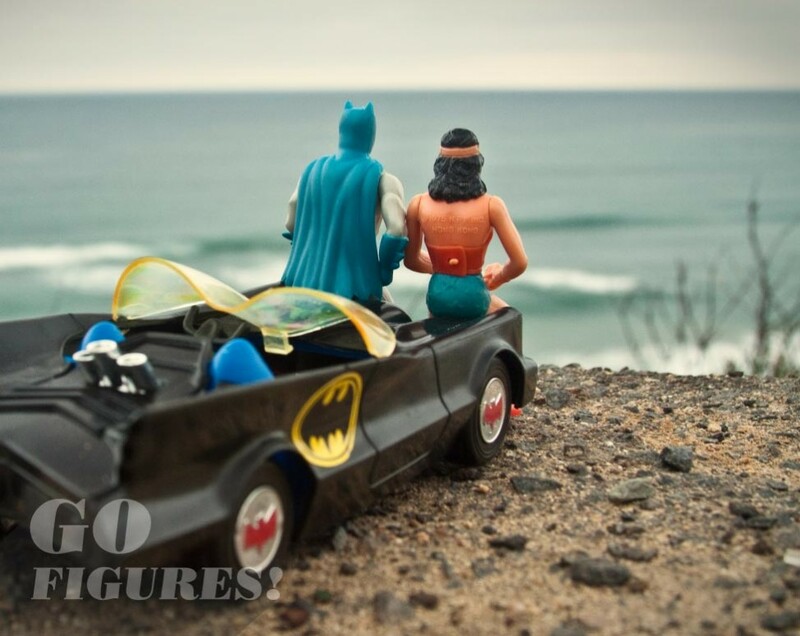 Wonder Woman and Batman sit on the hood of the Batmobile parked at the beach looking out into the ocean. In Gran Torino, Starsky and Hutch are out on the beat. Graffiti in the background and mini skirted figure just out of frame suggests a seedy neighborhood. Ponch of the California Highway Patrol sets a speed trap for everyone from the Duke boys to The Greatest American Hero. The Avengers take a day off from saving the world to enjoy a beautiful afternoon bike ride. These are the photos that truly resonate with me on a personal level. They conjure the feeling of playing with toys as a child, when they were something far more important than colorful bits of plastic but totems of the imagination. They are joyful depictions that honor the significance of the artifacts. 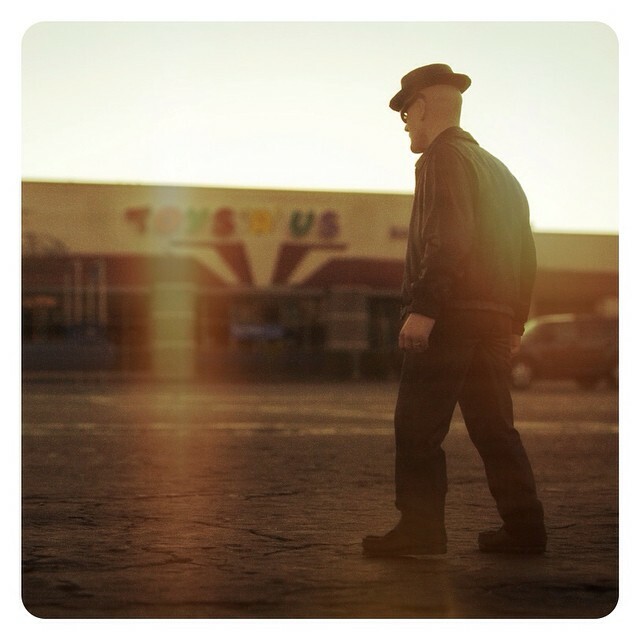 Occasionally, Neumann’s lens ventures into the topical as reflected by his photo of the Heisenberg figure menacingly approaching a Toys”R”Us. Nuemann’s response to the Susan Meyers petition hoopla is on-target. This same topical thoughtfulness is present in a photo posted after the passing of Dukes of Hazzard actor, James Best, which shows Best’s action figure counterpart with hat in hand—a respectful tribute to a beloved icon. Neumann’s work is proof of what I’ve come to believe, that toys are yet another artistic medium, in their design and presentation. These artifacts hold the psychic imprint of childhood and are able to conjure a myriad of feelings. Isn’t that what art is supposed to do? Danny Neumann’s photography skillfully harnesses these feelings and is clearly the work of a person in touch with his imagination. It’s easy to envision him lying on his stomach setting up the perfect shot, a smile on his face as he plays with his toys. If looking at toys is your thing, I recommend doing so through Danny Neumann’s eyes. It had to be done. His work is so great. He should publish a book.